My research focus is on applied and computational mathematics, in particular on parallel scientific computing, inverse problems and optimization with PDEs, uncertainty quantification, and numerical methods for variational inequalities. The main applications driving my research are from geophysics and fluid dynamics. 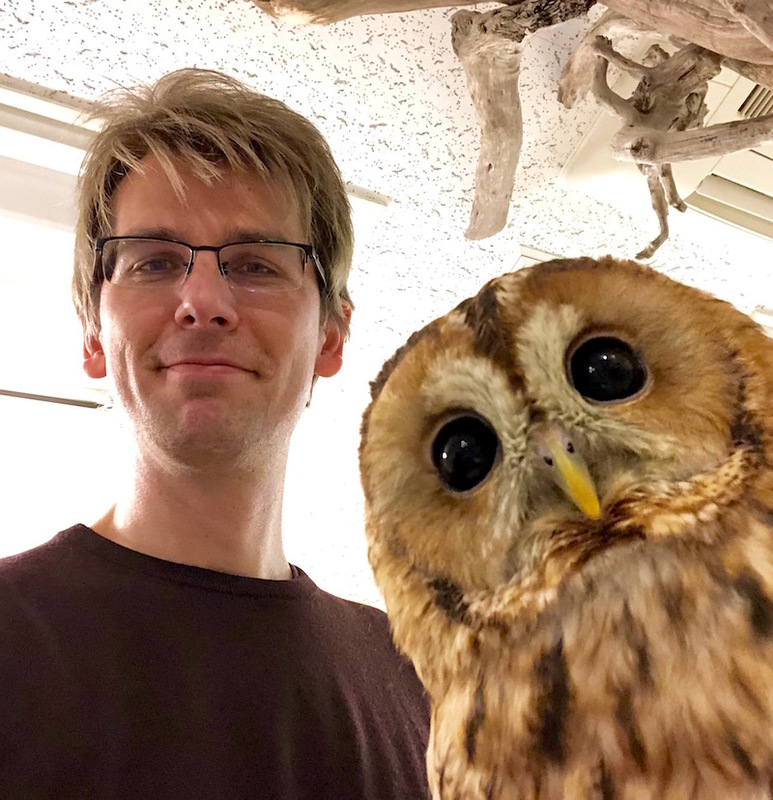 If you are interested in a more serious photo, where I am not photo-bombed by a Japanese owl, here’s one. Teaching: In spring ‘19, I’ll be co-teaching the Advanced topics course High Performance Computing (flyer). Organization: I’m co-organizing Courant’s Numerical Analysis and Scientific Computing Seminar I’m also organizing a workshop on Optimization and Inversion under Uncertainty as part of the RICAM Special Semester on Optimization 2019. Funding: My research is supported by NSF (DMS-1723211, EAR-1646337), the Department of Energy (DOE) under the SciDAC-4 program ProSPect, KAUST, and the Simons Foundation. Group: Current PhD students: Karina Koval, Chen Li, Melody Shih, Shanyin Tong (all NYU). Former PhD students: Yair Daon (NYU), Tobin Isaac and Johann Rudi (both at UT Austin, co-advised with Omar Ghattas). Current postdocs at NYU: Andrew Giuliani (co-mentored with Marsha Berger), Tonatiuh Sanchez-Vizuet (co-mentored with Antoine Cerfon), Matt Dunlop. Congrats to Johann for winning the outstanding dissertation award of the CSEM program at UT Austin! I’m co-organizing a session on HPC in the geosciences at the SIAM-GS meeting in Houston, TX and will attend the conference on Monday and Tuesday. Attending the SIAM CSE conference in Spokane, WA, Feb 25–March 1 to give a talk on OED there. Thanks also to the SIAG-CSE for awarding us a best CSE paper award for our 2015 JCP paper! An article about our G2S3 summerschool last summer just appeared in SIAM NEWS. I’ll attend ICUME 2018 in November, where I will give a talk about optimal control under uncertainty. Also giving the Mathematics colloquium at Johannes Gutenberg University in Mainz, Germany, on November 22. I will attend the VI Latin American Workshop on Optimization and Control (LAWOC 2018) in Quito, Ecuador, September 3-7. I will also be at the SIAM MPE Conference in Philadelphia from September 13-15. Aug 14: Congrats to Johann Rudi for successfully defending his PhD thesis on scalable solvers for Stokes mantle flows. Very nice work! 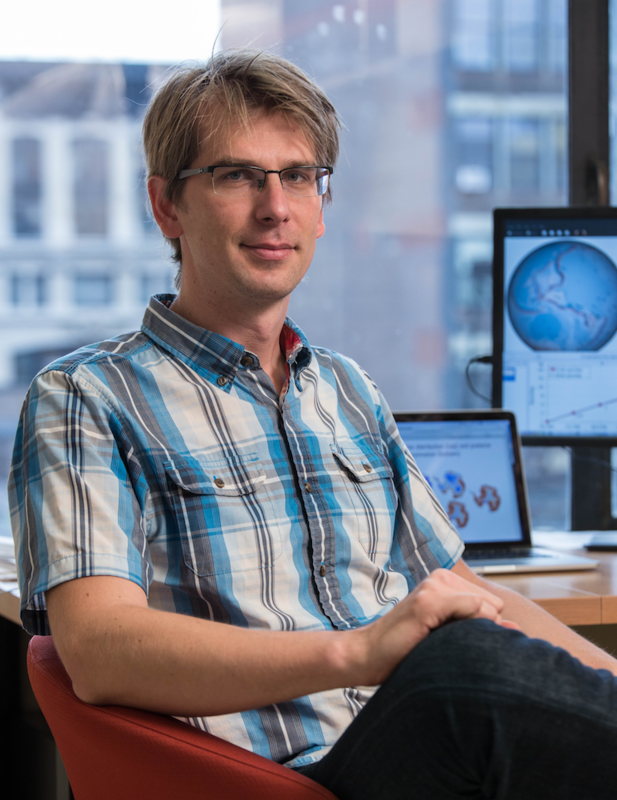 Johann will move to Argonne National Lab as 2018 Wilkinson Fellow. Aug 7: Giving a talk to high school students who are attending the NY Math Circle summer program on The Maths behind Bitcoin. June 1: Upcoming travel and talks: Seminar talk at the Inst. for Maths and Sci. Comp University of Graz (my alma mater!) on June 7; Summer school in Breckenridge, CO, June 17-30. April 6: Giving a lecture for high-school students at csplash on April 14 on the Maths behind bitcoin. March 14: I will be at SIAM UQ in Garden Grove, CA, this April. Feb 9: I will be going to SIAM PP in Tokyo in March, and am spending the week before at JAMSTEC. Feb 9: Giving a talk in the Numerical Analysis Seminar at NC State on February 13 at 3pm. Jan 10: Giving talks in the Mathematics Department of the University of Colognue on January 12 at 2pm, and in the Mathematics Department of TU Darmstadt on January 16 at 5pm. Nov 15: I will give a colloquium in Darmstadt, Germany on January 17, 2018. This will be a talk for a general mathematically interested public, and despite the German abstract, it will be in English. Nov 15: I am giving Courant’s AOS colloquium on Dec 13. Nov 1: I am co-organizing a 2-week Gene Golub Summer School in Breckenridge, Colorado in June 2018. Please take a look at our website, which is now accepting applications. Oct 20: Congrats to Yair for defending his PhD thesis! Aug 15: I will attend the Workshop on Bayesian and Nonlinear Inverse Problems at the Lorenz Center in Leiden, Holland. May 6: I’ll attend the Oberwolfach workshop on Computational Inverse Problems in Oberwolfach, Germany. Feb 24: I’ll be at the SIAM Conference on CSE in Atlanta, GA, Feb 27-March 3. Jan 10: Here’s a flyer for my Advanced Topics HPC class this semester. Jan 4: I will be giving a talk at the University of Arizona in Tucson on January 12. Nov 2: I’m doing two short intro sessions to the computing environment at CIMS. You can access the material by signing up for this Piazza site. Intro/question sessions are on Tuesday 11/8 and 11/15 at 12:30-13:30 in WWH #101. If you are intending to take my special topics class on HPC next semester, and you aren’t familiar with command line tools and basic UNIX, I highly recommend that you get familiar with this material posted on the Piazza site. Please email if you have questions. Oct 15: I will visit the Ecole Normale Superieoure de Lyon for the week of Nov 21-26. I will then visit Caltech from Nov 27-30. Oct 15: I’ll be at the AGU Fall Meeting in San Francisco from December 12-16, and will give a talk entitled Towards Bayesian Inversion in Mantle Convection on December 13. Oct 15: Giving a seminar talk at UBMC on November 7. Oct 10: I’ll be giving a seminar talk in the Applied Maths Colloquium at NJIT on Oct 14. Sep 10: Congrats to Johann for winning the 2016 ACM/IEEE Fellowship! Aug 4: I’ll be at the Advancing X-cutting Ideas for Computational Climate Science meeting in DC Sep. 12-13. Aug 4: I will attend the SAMSI Optimizaton Program Opening Workshop in Durham, NC Aug 29-Sep 2. March 24: I’ll give a talk on Inversion/UQ in Geophysics at the CIG Meeting in Davis, CA June 20-22. March 20: Giving a talk to high-school students on Mathematics and Supercomputing at cSplash on April 23. March 10: Congrats to PhD students Johann Rudi for winning the student paper competition at the Copper Mountain Conference, and to Tobin Isaac for receiving an outstanding PhD thesis award. Both, Johann and Tobin are student at UT Austin, who were co-advised with Omar Ghattas. Feb 25: I will attend the PASC16 conference from June 8 to June 10. Feb 20: I will be attending the SIAM Conference on Uncertainty Quantification in Lausanne, Switzerland from April 5-8.